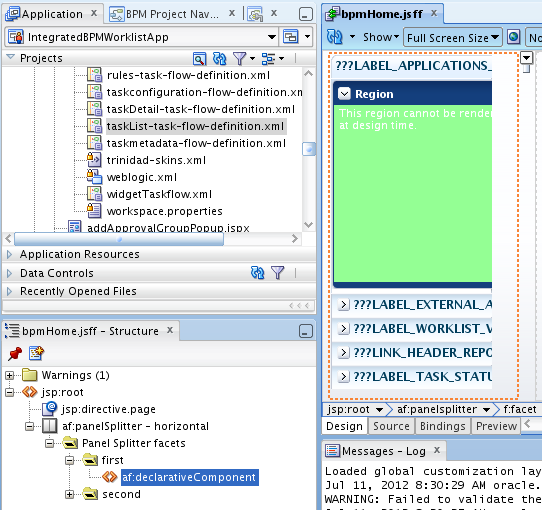 Oracle BPM 11g PS5 Task List task flow can be included into custom ADF 11g application. 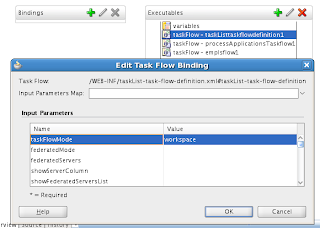 This task flow can be executed in 2 modes - worklist and workspace. 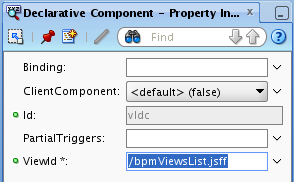 I already blogged about worklist mode, see here - ADF 11g PS5 Application with Customized BPM Worklist Task Flow (MDS Seeded Customization). Today I'm going to cover different tips & tricks how to run Task List task flow in workspace mode. 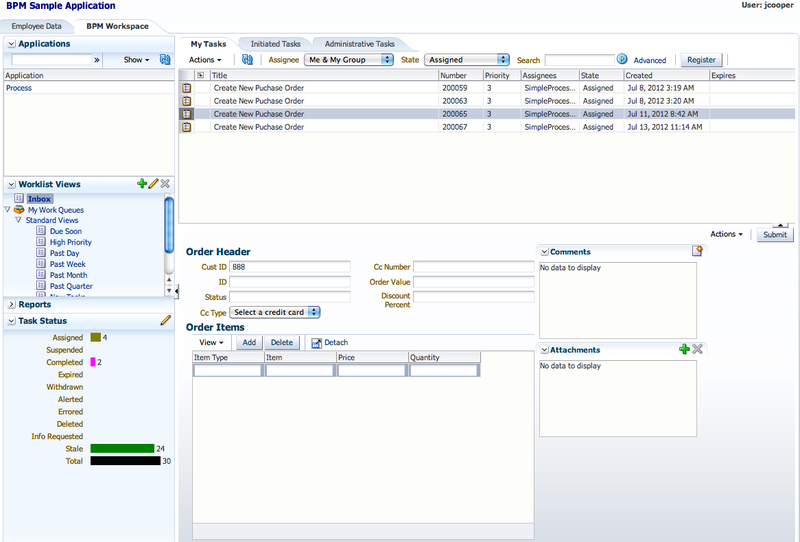 Workspace mode gives more functionality to the end user - it allows to render list of BPM processes, more dashboards, etc. 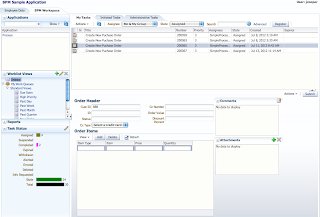 User can start new BPM process through Task List task flow configured in workspace mode. Download sample application configured with BPM 11g PS5 Task List task flow for workspace mode - IntegratedBPMWorklistApp_v3.zip. 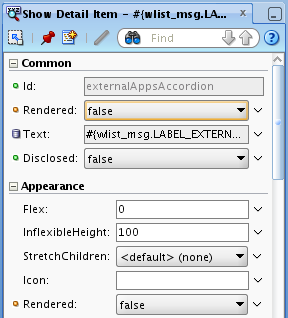 This application is based on the same sample from previous blog for worklist mentioned above. 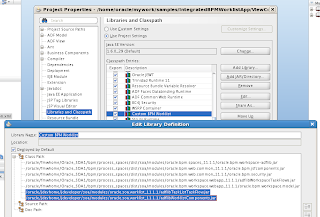 You should notice that two last libraries are coming from JDEV home. 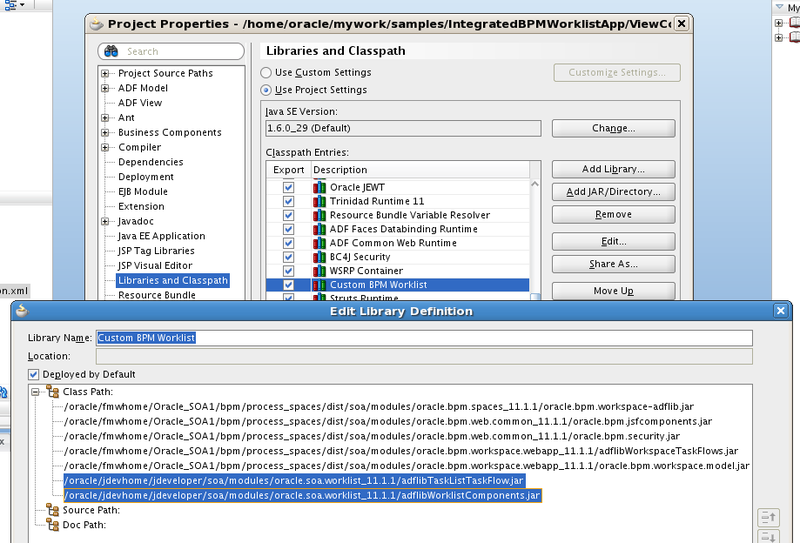 These libraries provide us with BPM Task List task flow. 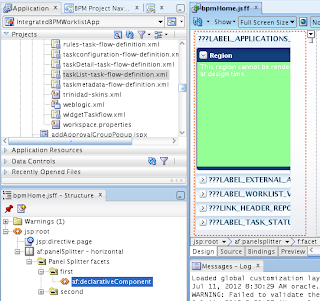 Same libraries are available in SOA home as well - strange enough when using libraries from SOA home for BPM Task List task flow - my custom application was not working. Keep in mind this, if you face strange runtime exceptions, to check what libraries you are including. The source code of the application seems to be having some issue. 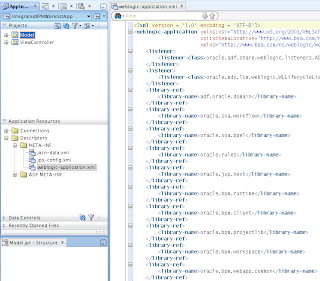 the weblogic-application.xml is not as shown in the screenshot. When I try to deploy this app it gives strange runtime errors. Can you please upload the source code once again. Also, one more question as per the screenshots the features provided by the taskflow in worklist mode are almost the same. What is the advantage of using the workspace mode. Uploaded source code is correct, double check on your side. 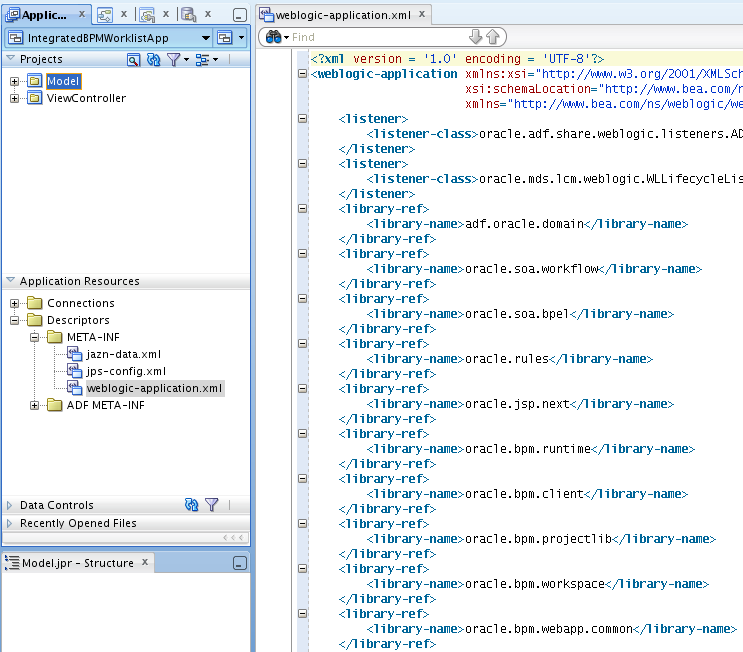 I have compared weblogic-application.xml is same as in screenshot. You are right it was my bad. The app now works . Realy helpful. 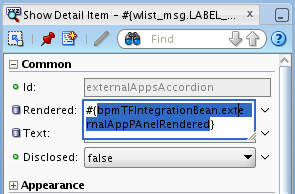 One question though there is hardly any difference between the taskflow in the worklist mode and the workspace mode. When do we use worklist and when when do we use workspace ? 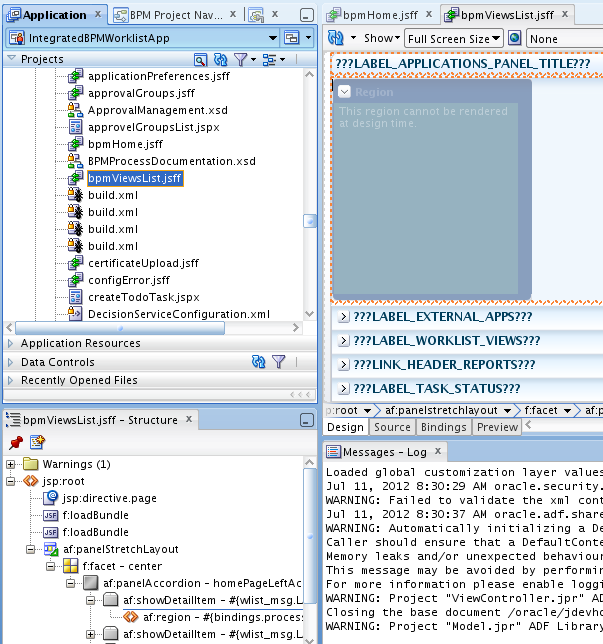 Main difference - worklist mode doesnt offer option to start new BPM process, while workspace mode does. I know it's been ages since this post, but could you make the zip file available again?